The extension to Elliott's Field Shopping Park in Rugby has been completed, with the first store opening on Saturday, November 25, and more set to begin trading through December and January. Carpetright will open tomorrow (November 25), with DFS, Dwell, Oak Furniture Land, Furniture Village, Sofology and Tapi openings due during December and into January. These stores will be joined by Halfords and Rugby’s first Starbucks which is set to open on December 2. Tom Cochrane, development manager, at Hammerson, which owns the shopping park, said: “We are delighted to announce the extension to Elliott’s Field is ready to open...with a great range of new stores for shoppers. 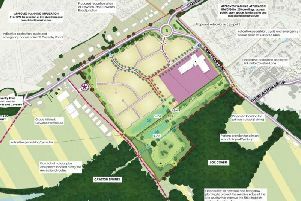 “All the units are either let or in advanced negotiations, which shows how attractive the town is to retailers, and we are particularly pleased that doors will be open in time for Christmas and the Boxing Day sales. “We know from recent research that customer satisfaction at Elliott’s Field is very high, and that more than two-thirds of shoppers are drawn from the wider area. The work will continue until early 2018. The first of two new entrances to the extension has also been created off Old Leicester Road. A spokesperson for Hammerson said Elliott’s Field Phase II is a £20 million investment in Rugby, creating 120 new jobs in addition to the £35 million invested and more than 380 jobs created at Elliott’s Field already. In September Rugby First voiced concern over the impact plans to expand Elliott’s Field may have on businesses in the town centre. Aftab Gaffar, Rugby First managing director, said: “The town centre is still feeling the impact from the first application. Footfall has dropped every month, customer sales have fallen, vacancy levels have increased, consumer confidence is low and we have lost some major retailers from the town centre. A spokesperson for Elliott’s Field said the extension will create 120 new jobs and its mostly bulky goods stores would not impact the town centre.